Natural convection is one of the most effective solutions to cool electronics devices. Heat sinks used in this area are usually extruded profile saw cut and machined according to the assembling of the electronic components. The main inconvenient of this kind of heat sink is that the heat transfer rate is very low and the maximum heat flux managed by this type of cooler is 70 W/cm2. Convection is a kind of heat transport in which the heat is moved away from the hot source by fluid motion. This fluid can be either water or air. In natural convection, the fluid motion is not caused by an external means but is the consequence of natural mechanisms (i.e. a buoyant force and gravitational force). When the fluid passes the heat source a temperature gradient occurs, and the hot air expands, becomes less dense and rises. where Q/t is the heat transfer rate (heat transfer for unit time), h is the heat transfer coefficient, A is the hot surface and (Thot-Tcold) represents the temperature difference between the hot source and the surrounding fluid. This last element demonstrates how strongly the thermal performance of the system depends upon the environmental conditions. The formula also shows the direct proportionality between the heat transfer rate and the free surface. 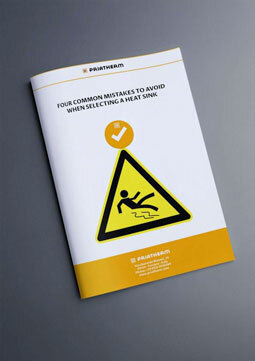 To increase this area, heatsinks usually have a complex profile and structures called fins. 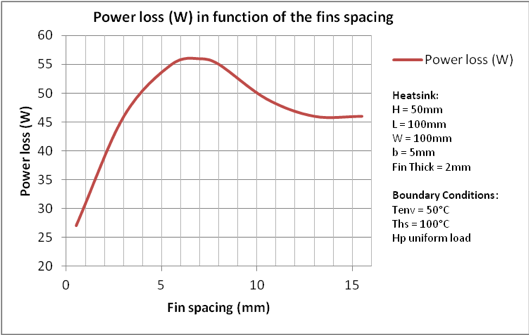 Past a certain point, however, increasing the number of fins and reducing their spacing will not improve the heat transfer rate. In fact, in natural convection the flow motion is laminar, and so the boundary layer is not negligible. When the fins become too close to each other their boundary layers overlap, and this requires a higher flow pressure just as in forced convection. As explained before, the flow motion in natural convection is caused by buoyancy force and gravity. The air coming into contact with the hot surface becomes warmer, reduces its density and rises. For this reason, the orientation of the heatsink affects its thermal resistance. In the vertical orientation (Figure3_a), the fins have the same orientation as the airflow, helping the cooling of the heatsink. In comparison, Figure 3_d shows the worst possible working condition because the base interferes with the flow path. 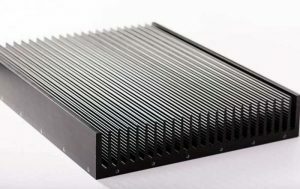 To achieve the maximum advantages using this process, heatsinks operating in natural convection should be black anodized and, ideally, contain a large-scale roughness. A heatsink operating in natural convection is not very bulky and is highly cost effective. On the downside, it accommodates a maximum dissipated heat flux of 70 W/cm2. 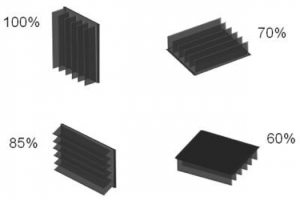 To maximize the heatsink performance, suppliers should design an appropriate profile to increase the surface for the heat exchange while maintaining the working conditions for natural convection.